One of the biggest common student worries is what we’re going to do when we graduate. As a Music student, I am more than used to people telling me that they are worried for my career and future; it’s not perceived as the most “employable” subject to take at degree level. Most people think that it’s a bit of fun for three years and then we leave University, only to have to settle for mundane jobs in a totally non-musical setting. This certainly isn’t the case for the majority of Music graduates, especially from Surrey – they have gone on to do amazing things! And personally, my passion is teaching; I’d love to be a Secondary School music teacher when I finish University. I recently attended the University of Surrey’s Autumn Careers and Placement Fair, on Wednesday 12th October 2016 in the marquee on the PATS field. This was an amazing opportunity for students to explore the career possibilities available for them not only after they graduate, but also during their degrees. 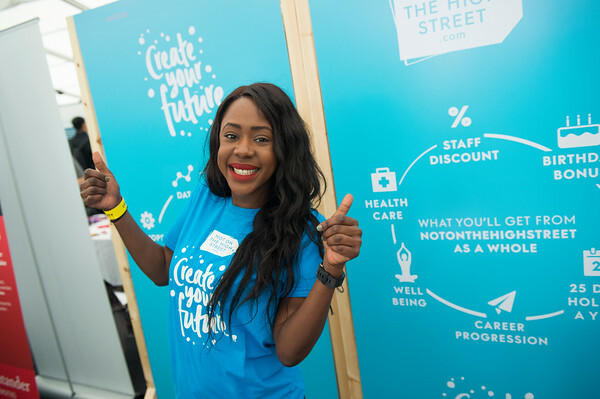 I had never actually attended the Autumn Careers Fair before – I either didn’t get round to registering, was busy with my course or felt that it “wasn’t for me”. How wrong could I be! Going this time round completely changed my perspective on the potential I have in the future. 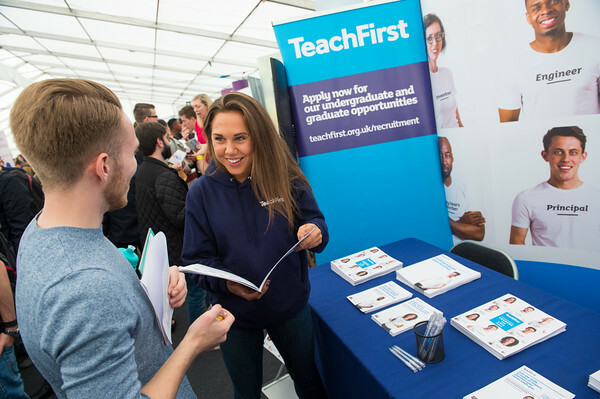 At the Careers Fair, I was drawn to the various employers looking for teachers to join their schemes – this included TeachFirst, Teach Surrey and many others. I found that the exhibitors were incredibly friendly and approachable, which encouraged me to communicate clearly about what I want to do in my career and the impact that I want to make. There were 150 different companies and employers there, and the event was free and open to all students; what an amazing opportunity! So after I’d chatted with some of the exhibitors in the realm of work that I’m interested in, I went round the fair and met various employers from companies I’d never heard of. I learnt about companies looking for engineering and computer science students, such as BAE Systems, AECOM and TRL, and also companies who employ Languages/Arts/Social Sciences students such as Jacobs Douwe Egberts. There was a company handing out loads of free chocolate (Express Vending Ltd) which was one of my personal favourites! 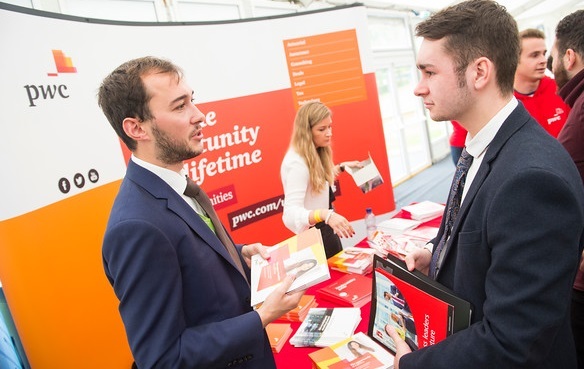 But from going round the fair for a couple of hours and having the opportunity to chat with all of the exhibitors, I got the impression that many roles in these companies can suit the individual, meaning that you don’t have to fit a really strict mould. Individuality is still valued, and there are so many exciting work opportunities out there. 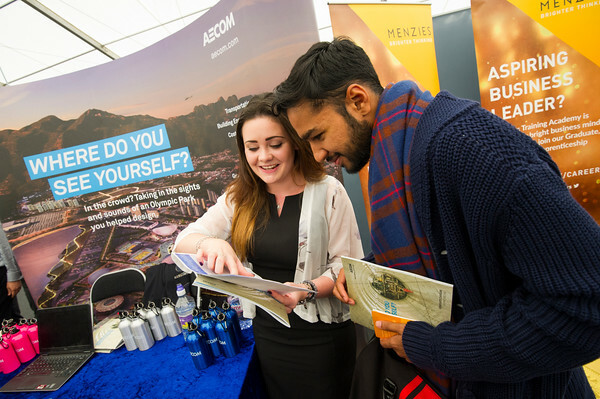 For a full list of the companies that were at the fair, and further information about what kind of student they are looking for as part of their various schemes and placements, follow this link. The companies all had varied and attractive stands, piled with information and freebies. Plus, it was an excellent opportunity to stock up on all of those pens you miraculously lost after Freshers’ Fair… and to get your hands on all sorts of quirky merchandise too! There was food, stationery, an array of water bottles, keyrings, bags and all sorts of other fun freebies to take away and remember the companies by. The variety of companies present at the fair really gave a sense of community and the atmosphere was buzzing throughout the event. 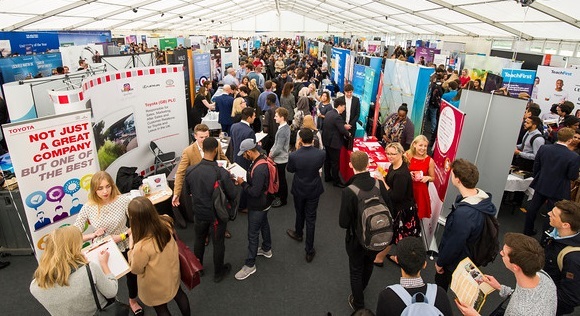 I think that the Careers Fair is really important for students to attend, as well as all of the other exciting opportunities for personal development that the Careers Service provide. 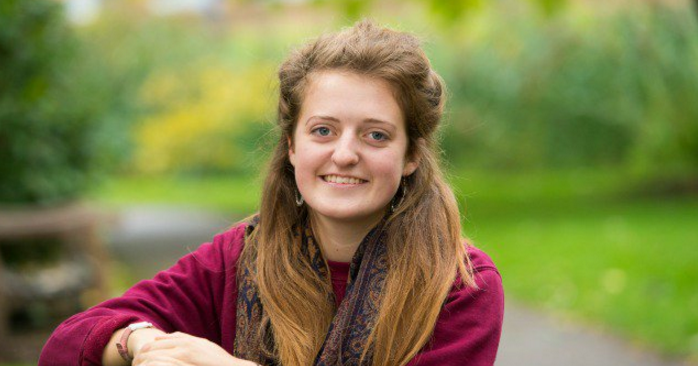 Particularly for second years thinking about placement and final years thinking about postgraduate opportunities, this is a unique chance to really explore what’s out there and ultimately make the decision about what you want to do when you leave University. I know it feels like it’s a while away, but the time flies at a scary rate and it really does pay to be prepared! If you feel you want some help at any stage during your degree, The University of Surrey has an active and approachable Careers Service. They run tons of events, workshops, CV writing skills sessions and opportunities to meet employers, as well as one-to-one sessions with careers advisors. The Careers Service website is also really useful, highlighting the numerous sessions that students are able to go to. They occur almost daily – check out the event’s calendar right here! Careers Fair: 3 Questions with Enterprise Rent-A-Car, Expedia & Vodafone Group!